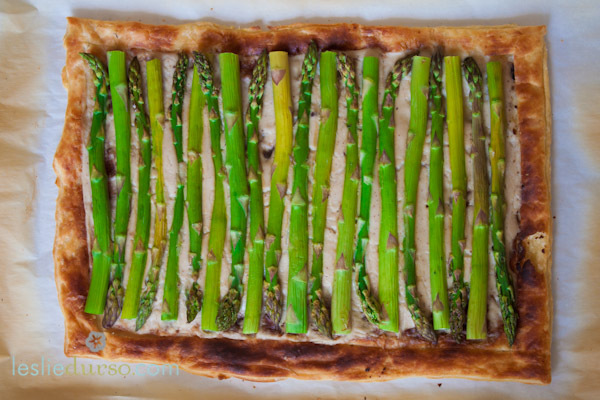 This week I was challenged by my friend to “veganize” Martha Stewart’s Asparagus Tart. It was so beautiful I couldn’t wait! Martha uses gruyere cheese in hers, but I decided to make a vegan bechamel sauce for mine. It created a nice creamy flavor without all the dairy. And you might be thinking to yourself, puff pastry is vegan?? Well, yes, you can make your own puff pastry from scratch using Earth Balance butter as a replacer OR Pepperidge Farm frozen puff pastry is actually vegan(!) So give this recipe a try, it would be a perfect for Easter or a fabulous Sunday brunch 🙂 Enjoy! Meanwhile, heat the almond milk in a separate pan until just about to boil. Add the hot milk to the butter mixture 1 cup at a time, whisking continuously until very smooth. Bring to a boil. Cook 10 minutes, stirring constantly, then remove from heat. Season with salt and nutmeg, and set aside until ready to use. On a floured surface, lay out the puff pastry and roll to rectangle shape approximately 16 X 10. Place the pastry on a parchment paper lined cookie sheet. Lightly score the dough 1 inch from the edges to create a frame. Using a fork, pierce the dough in the center of the frame to prevent bubbles. Bake for 7 minutes. Remove from the oven and spread bechamel sauce in the center frame. Lay the asparagus (trimmed to fit) on top and sprinkle with a pinch of salt and pepper. Bake for 15 minutes or until asparagus is tender. Serve warm or at room temperature. Looks delicious! I love asparagus, thanks for recipe. Delicious and healthy recipe, thank you!!! Awesome!! Thank you for sharing this delicious tips. Hi, I loved the site, I’m reading one article after another. I loved your post! Thank you for sharing this valuable Content. Lovely this post! I will done! I love asparagus! I’ll make your recipe and come back to tell you how it was! Leslie, I’m so sorry you’re beautiful! With a lot of respect of course. Congratulations on the work, thank you for sharing! Loved the recipe! Veganize life is the way ! Lets cook and eat! This looks good! Thank you for the recipe! wow, look delicious! thanks for sharing! It seems to be delicious, I’ll do it. I hope my family likes this recipe. I loved this recipe, I can not wait to do it, I’m sure it will be delicious, because I love asparagus. I hope you keep posting wonderful recipes like this. Simply wonderful recipe !! I’m definitely going to test !! Congratulations, your recipes are beautiful and they look delicious. I love arparagus! I will try to make this. Seems to be great, a very attractive dish. I’ll prove ! Thanks for this recipe, Leslie! Maravilhosas suas receitas, obrigada por compartilhar! wow, I honestly loved brazilian food needs told touches. I enjoyed wonderful recipe thank you! I really liked it, congratulations !! I’ll confess i dont like Aspargus. Awesome! looks delicious. I loved! Very Very Good! Woo I Love You! Very easy to make and really nice option for vegans. I love asparagus!! I am gois to make this recipe here, for sure everybody going to like it!! So delicious! I’m going to do this Wednesday for my husband, thank you! I loved your recipe! I’m going to take advantage of the holidays to surprise the family!